To many non-Muslims, the existence of an Islamic community on the island of Sri Lanka may be surprising. Sri Lanka has been known for the past three decades as the scene of an atrocious civil war. Its Buddhist Sinhala majority, with 69.1 percent of the national population of 21.5 million, was challenged by Tamils – 7.1 percent, and mainly Hindu in religion, whom the secessionist Liberation Tigers of Tamil Eelam or "Tamil Tigers" aspired to represent. The "Tamil Tigers" were defeated militarily in 2009. But Sri Lanka also counts 7.6 percent of its people as Muslims, and among them, as elsewhere throughout South Asia, the spiritual tradition of Sufism is vigorously present. After 1973, and the Arab oil embargo that enriched Saudi Arabia greatly, the ultra-fundamentalist Wahhabi sect, which is the official religious interpretation in the Saudi kingdom, began to penetrate Sri Lanka's adherents to Islam. The Wahhabis in Sri Lanka act through a movement called Thawheed, or Monotheism. They opened numerous medresas. They despise Sufis. 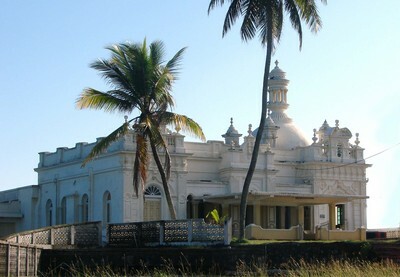 The 10th c. CE Ketchimalai Mosque, Beruwala, Sri Lanka -- Photograph 2009 Via Wikimedia Commons. The Wahhabi, Deobandi, and Mawdudist jihad trends have revealed their ambition to control South Asian Islam through violence in Afghanistan, Pakistan, India, and Bangladesh. In all these countries traditionalists resist them. The Sufis of Sri Lanka, although obscure to the rest of the world, deserve no less support than anti-radical Muslims elsewhere in the region and around the globe.